If visions of Gilded Age summer cottages, impressive cliff views, and classic New England getaways are what come to mind when you think about Newport, Rhode Island, than you surely won’t be disappointed with your PCS there. Most who arrive even for a short assignment consider their time in Newport an opportunity to take advantage of the abundance of recreational activities the region has to offer. Because Newport is home to the prestigious Naval War College, many military members don’t stay the traditional duty period of 2-3 years. The school cycles typically range from 12-15 months, but there are more than 25 naval and defense commands and activities based in Newport, so there are some long-term assignments available. Newport is located on Aquidneck Island, as are its popular neighbor cities Portsmouth and Middletown. It’s easy to picture the geography of the island if you think of it from North to South orientation with Portsmouth up top, Middletown in the middle, and Newport at the bottom of the island. Newport’s island location necessitates familiarity with bridge travel, especially if you are considering a home in Jamestown. Jamestown is about five miles in distance from Newport, but on another island to the west, Conanicut Island. Expect bridge traffic over the Newport/Pell Bridge to make the commute time longer. Residents are encouraged to apply for discounted fees for the toll. It’s also a good idea to familiarize yourself with the Mount Hope Bridge. It connects the northern side of Aquidneck Island at Portsmouth to mainland Rhode Island at Bristol. In addition, Sakonnet River Bridge, also in Portsmouth, connects the northeastern portion of the island to the mainland at Tiverton. Winter Sledding on Aquidneck Island: Fort Adams State Park, Morton Park, Aquidneck Park St., George’s School, Middletown High School, Portsmouth Middle School. 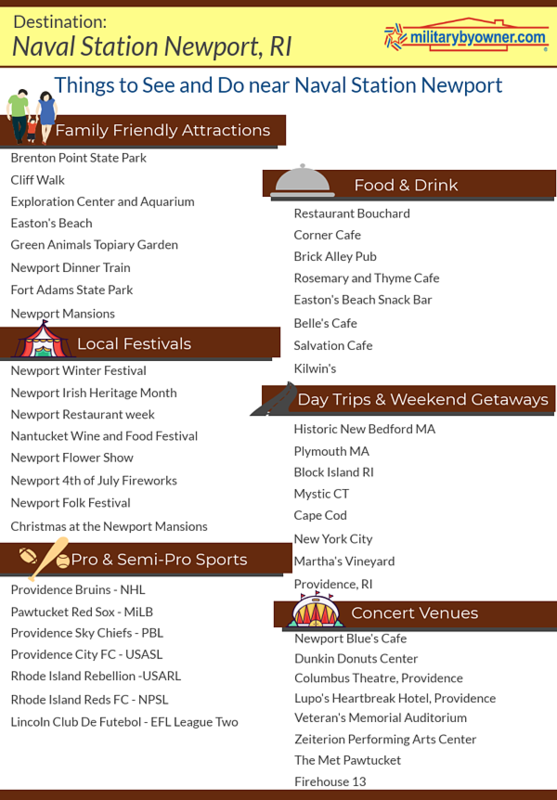 Even before arriving in the city, you’ll want to dive into these resources to sign up for events, be notified of deals, and basically stay in the know about all things Newport: The Newport Buzz and Discover Newport. 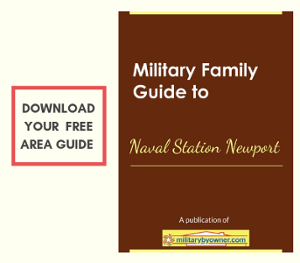 For the real scoop on local Newport military family resources, be sure to get your hands on a copy of the coveted Pink Book (it’s really pink!). Otherwise known as Off the Record, the compilation is produced every other year by the Military Spouses of Newport. The 145-page book is chock full of information on local activities, base info, family, food, recreation, shopping, travel, and service recommendations. Only the members of the Military Spouses of Newport may nominate vendors. Printed versions are available for purchase at The Ship’s Bell, an on-base store with a mission to support community aid, military programs, and scholarships for graduating high school seniors and spouses of local military members. The online version is available to members of the Military Spouses of Newport. Newport is lovely, of course, but its close proximity to other iconic destinations means you'll need to make room for plenty of day trips and overnights to places like Boston, Cape Cod, and other New England states that you probably won’t get back to easily. 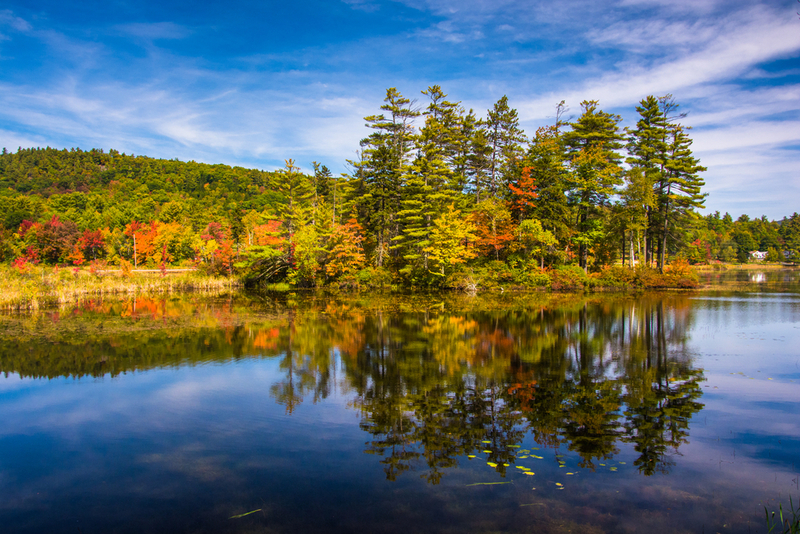 Think about a fall leaf peeping tour through Vermont, New Hampshire, and Maine! Part of what makes regional travel easy is access to the user friendly airport in Providence, which is about a 30-minute drive and in many instances, much simpler and cheaper than driving 1.5 hours into Boston to leave from Logan International. Amtrak provides connection service from Providence via complimentary shuttle bus service between the Providence train station, convention center, downtown, and the Providence to Newport ferry terminal. For more information on Amtrak travel on the East Coast, check out Train Travel with Pets: An Amtrak Update. You’re going to need a bucket list for living in Newport! There are so many options, from local eateries to access to nearby international travel. Don’t let the time slip away while you’re lounging on Easton’s or Bailey’s Beach. You’ve got things to see and do!